I did this quilt about five years ago. I had found the pattern in an old book from Better Homes and Gardens called "Quilting pieces of the Past". 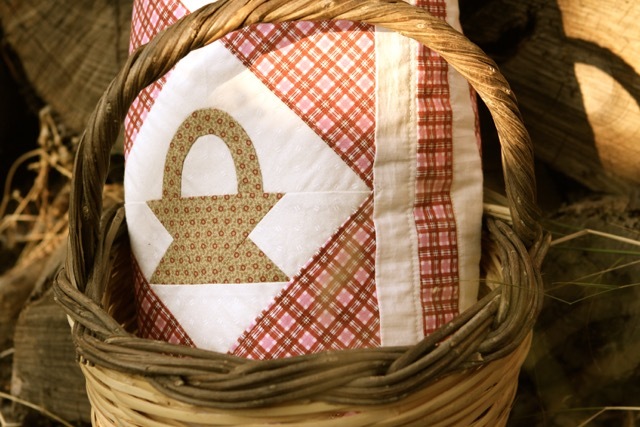 Being a fan of baskets, when I saw the picture of this quilt I "fell in love" with it at first sight! I had a lot of brown fabrics and scraps in my stash and thought it would be a good opportunity to use them. For each basket I used a different fabric. 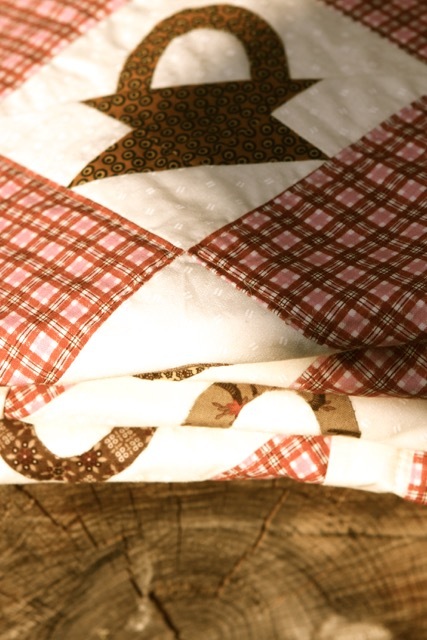 The quilt is single bed size and is machine pieced, machine quilted and hand applique. I don't know which is prettier... The quilt or your photos! Love the scrappy brown baskets and its a very pretty setting. Thanks for sharing! Very pretty quilt, I like the three strips between each, set them off. Oh how pretty, it's got a real vintage charm! Oh I too always enjoy my visits to your posts. 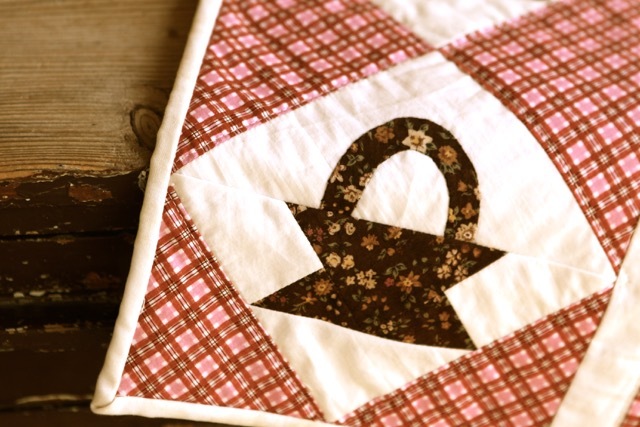 Your quilts always inspire!! LOVE IT!! You are a marvel! I always like to see basket quilts, they are so timeless; and this is another lovely one. It is a lovely quilt. Scrap quilts are always fun to make. I have always wanted to create a basket quilt, but somehow, I just haven't. So many pattern choices for creating quilts. LOL would have to be able to make a quilt every single day in order to make every one that catches my attention. Thanks for sharing and have a wonderful creative day! I love your basket quilt! It is just lovely and has such an old fashioned charm to it. Your quilt is lovely! Great job. So pretty! 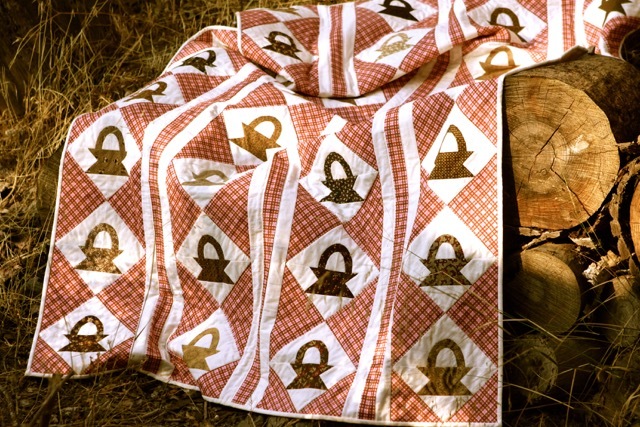 This quilt has a spot in my memory, too. Love your choice of plaid. 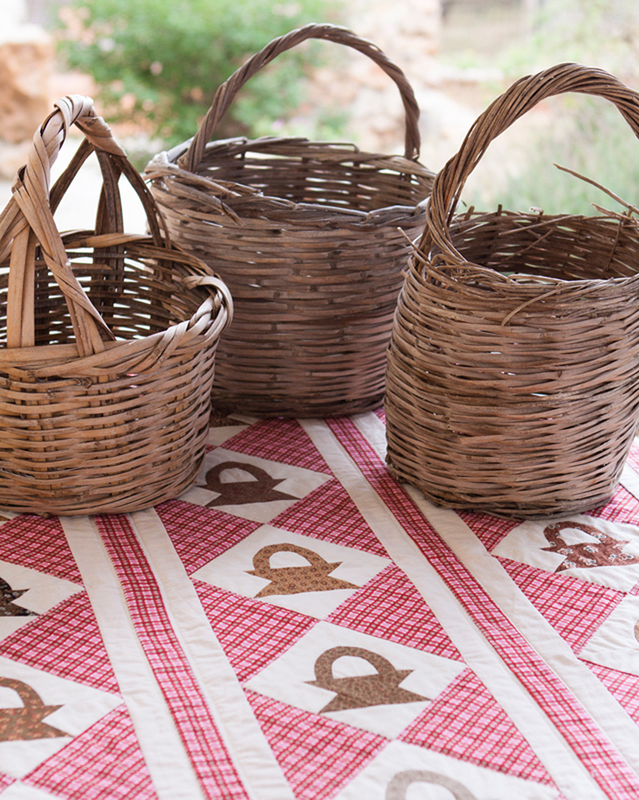 Oh I love basket quilts too especially in browns! Really enjoyed your photos. Oh, j'adore ce modèle superbement interprété!!! Gorgeous basket quilt Christine. I love it! Simple and fresh! I LOVE this basket quilt. Your basket quilt is wonderful. I think the book is in my collection, will have to go find it. Such a lovely vintage quilt.. I love the simple colour scheme! What a wonderful basket quilt. Love the color choice! 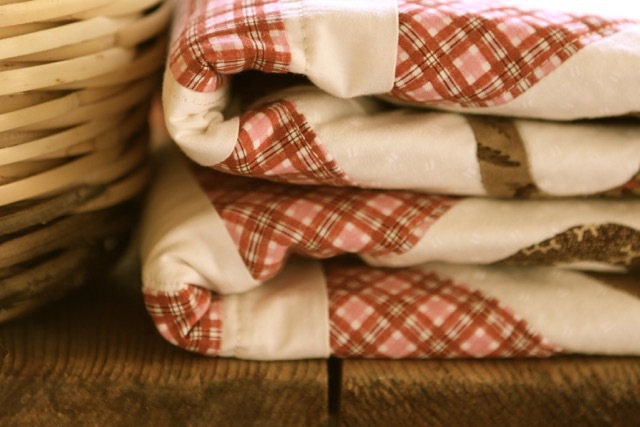 The combination of your sweet brown baskets with the rosy plaid is a delight. I could use a bolt of that plaid! Love this quilt so much. I could start immediately. Thanks for the inspiration! What a perfect place to showcase brown fabrics. Always fun to fall in love with a pattern and then turn it into a quilt. It's absolutely beautiful! Thank you for sharing pictures.